Wrangling RC Servos Becoming a Hassle? Try Serial Bus Servos! When we need actuators for a project, a servo from the remote-control hobby world is a popular solution. Though as the number of servos go up, keeping their wires neat and managing their control signals become a challenge. Once we start running more servos than we have fingers and toes, it’s worth considering the serial bus variety. Today we’ll go over what they are and examine three products on the market. Our open source community invites anyone with an idea to build upon the works of those who came before. Many of us have encountered a need to control linear motion and adapted an inexpensive hobby servo for the task. [Michael Graham] evaluated existing designs and believed he has ideas to advance the state of the art. Our Hackaday Prize judges agreed, placing his 3D Printed Servo Linear Actuator as one of twenty winners of our Robotics Module Challenge. [Michael]’s actuator follows in the footstep of other designs based on a rack-and-pinion gear such as this one featured on these pages, but he approached the design problem from the perspective of a mechanical engineer. The design incorporated several compliant features to be tolerant of variances between 3D printers (and slicer, and filament, etc.) Improving the odds of a successful print and therefore successful projects. Beginners learning to design for 3D printing (and even some veterans) would find his design tips document well worth the few minutes of reading time. Another useful feature of his actuator design is the 20mm x 20mm screw mounting system. Visible on either end of the output slider, it allows mixing and matching from a set of accessories to be bolted on this actuator. He is already off and running down this path and is facing the challenge of having too many things to share while keeping them all organized and usable by everyone. The flexible construction system allows him to realize different ideas within the modular system. He brought one item (a variant of his Mug-O-Matic) to the Hackaday + Tindie Meetup at Bay Area Maker Faire, and we’re sure there will be more. And given the thoughtful design and extensive documentation of his project, we expect to see his linear servos adopted by others and appear in other contexts as well. This isn’t the only linear actuator we’ve come across. It isn’t even the only winning linear actuator of our Robotics Module Challenge, but the other one is focused on meeting different constraints like compactness. They are different tools for different needs – and all worthy additions to our toolbox of mechanical solutions. [Tobias Kuhn] had watched a YouTube video about a robot arm which used servo motors, and wanted to try making one himself. But he found it hard to get slow or smooth movements out of the servos. Even removing the microcontroller and trying to work with the servo’s driver-IC and potentiometer from an Arduino Nano didn’t get him satisfaction. Then he found the very affordable 28BYJ-48 stepper motor. 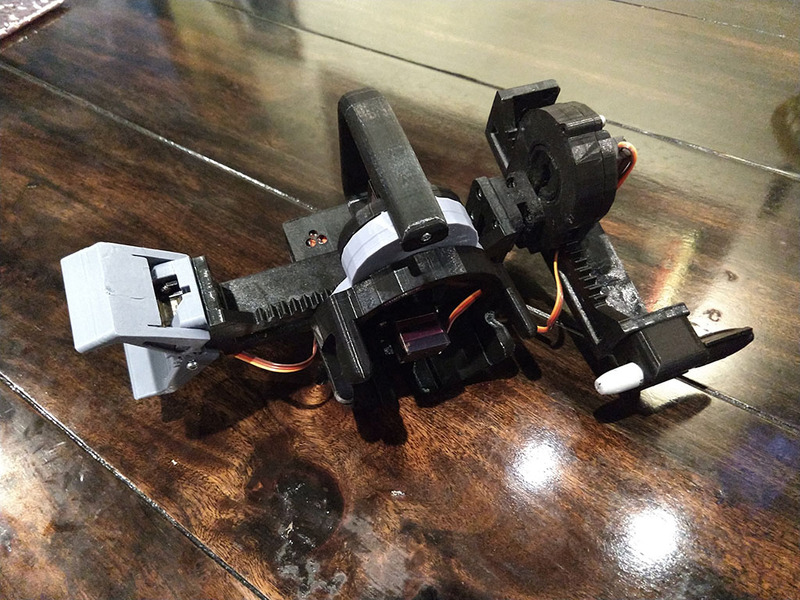 After some experimenting, he came up with a smooth moving robot arm with four steppers controlled from an Arduino Mega and A4988 stepper motor drivers. Rather than write a bunch of stepper motor code himself, he installed and ran a four-axis fork of grbl on the Arduino, turning it into a stepper motor controller. One minor hitch was that the A4988 motor drivers are for bipolar stepper motors but 28BYJ-48 steppers are unipolar. Luckily he knew of a very simple hack which our [Brian Benchoff] wrote about for turning a unipolar motor into a bipolar motor. To tell the robot arm what to do, he built a replica arm with potentiometers in place of the stepper motors. As he manipulates the replica, the values of the potentiometers are read by a Raspberry Pi and some custom Python code which sends the appropriate G-code to the Arduino/grbl controlled robot arm. There’s a bit of a lag but when he moves the replica arm, the robot arm does the same move. See it in action in the video below. We can’t decide if [MertArduino’s] robotic hand project is more art or demonstration project. The construction using springs, fishing line, and servo motors isn’t going to give you a practical hand that could grip or manipulate anything significant. However, the project shows off a lot of interesting construction techniques and is a fun demonstration for using nRF24L01 wireless in a project. You can see a video of the contraption, below. A glove uses homemade flex sensors to send wireless commands to the hand. Another Arduino drives an array of servo motors that make the fingers flex. You don’t get fine control, nor any real grip strength, but the hand more or less will duplicate your movements. We noticed one finger seemed poorly controlled, but we suspect that was one of the homemade flex sensors going rouge. How often do you think deeply about the products around you? How about those you owned five years ago? Ten? The Cicada — brainchild of [Daniel Kerris] — is an art piece that aims to have the observer reflect on consumer culture, buyer’s remorse, and wanting what we cannot have. The Cicada consists of an ultrasonic sensor feeding data to a Raspberry pi which — calculating the distance of an approaching human — either speeds up or slows down a servo motor connected to a General Electric Walkman’s cassette speed potentiometer. Upon detecting someone approaching, The Cicada begins to loop the chorus of Celine Dion’s “I Will Always Love You”. As you move closer, the tape speed slows, and there is a transition from love at first sight to nightmarish drawl as the music slows. Google showed the world that you could make a virtual reality headset from cardboard. We figure that might have been [Uladz] inspiration for creating a robotic arm also made out of cardboard. He says you can reproduce his design in about two hours. You’ll need an Arduino and four hobby servo motors. The cardboard doesn’t weigh much, so you could probably use fairly small motors. In addition to the cardboard, there’s a piece of hardboard for the base and a few metal clips. You can control it all from the Arduino program or add an IR receiver if you want to run it by remote control. There’s a video of the arm–called CARDBIRD–in action, below. We’re not 100% sure why this is being done, but we’re 110% happy that it is. Someone (under the name of [The X-Ray Playground]) is putting interesting devices under an X-ray camera and posting videos of them up on YouTube. And he or she seems to be adding a few new videos per day. Want to see the inner workings of a pneumatic microswitch? Or is a running pair of servo motors more your speed? Now you know where to look. After watching the servo video, we couldn’t help but wish that a bunch of the previous videos were also taken while the devices were being activated. The ball bearing wouldn’t gain much from that treatment, but the miniature piston certainly would. [X-Ray Playground], if you’re out there, more working demos, please! How long the pace of new videos can last is anyone’s guess, but we’re content to enjoy the ride. And it’s just cool to see stuff in X-ray. If we had a postal address, we know we’d ship some stuff over to be put under the lens. We don’t have as many X-ray hacks as you’d expect, which is probably OK given the radioactivity and all. But we have seen [MikesElectricStuff] taking apart a baggage-scanner X-ray machine in exquisite detail, and a DIY fluoroscope (yikes! ), so we’re not strangers. Who needs Superman? We all have X-ray vision these days. Thanks [OiD] for the tip! Bharat Khatri has followed a list.